The Austin Healthmate Junior is a heavy duty air cleaner just like the original Healthmate. This machine will remove most allergens from inside your home. If you suffer from asthma or allergies then this machine will help you breathe easier and finally get a good night's sleep. This machine is very similar to the original Healthmate. We feel that it is one of the best air filters for sell today. What is the difference? The junior version is smaller and lighter but it still packs quite a punch! This air purifier has several attractive features. Cleans up to 700 square feet. A 4 stage filter with a 5 year lifespan. 6.5 pounds of activated charcoal and zeolite to remove chemicals and odors. 30 square feet of medical grade HEPA filter to remove everything else. A 5 year warranty of the machine and a 5 year pro-rated warranty on the air filter. Foam sealed gaskets at the top and bottom to prevent air leaks. This model is designed to clean a 700 square foot room. We think that it does the best job in a room about 450 square feet or smaller. This will work in all the rooms of your house, unless you have very large rooms. The Healthmate Junior is 16.5" tall and it's 11 inches on all sides. So this is smaller than its big brother. It only weighs 18 pounds. This makes it more portable than the Healthmate. It does not come with wheels. If you want to put wheels on it, you will have to buy a wheel kit for about $50. We find that it is much easier to move this air purifier around. Most people will find this purifier easy to move around. However, at nearly 20 pounds not some people will not want to move it around. This is something to consider if you are planning to use it in different rooms during the day and night. The Austin Air Healthmate Junior uses the same four stage filtering system found in the original machine. The largest particles are filtered out by the stage 1 and 2 filters. This helps the main filter last longer. The charcoal and zeolite blend in the stage 3 filter removes the odors and some of the chemicals from the air. The last stage is a true medical grade HEPA. This filters out 95% of particles bigger than 0.1 microns and 99.97% of the particles bigger than 0.3 microns. Just like in all the Austin Air purifiers, you can clean the pre-filters by vacuuming. The filters can be vacuumed through the metal grille so you don't have to take the purifier apart. The pre-filters should be vacuumed once a month. The filter should last 3 to 5 years. They come with a 5 year pro-rated warranty. If your environment is dirty, expect to replace your air filters more often. For most people these air filters should last at least 4 years. 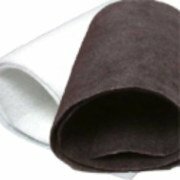 If you need an Austin Air Healthmate Junior replacement filter before 5 years you will receive a discount on the purchase price of a new filter. Note: You have to call customer service at Austin to receive this discount. 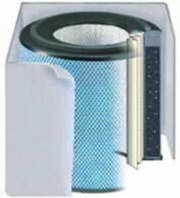 One drawback we find in this filtering system is that the charcoal and HEPA filters cannot be replaced separately. You might find yourself having to replace the whole filter when only one part of it is clogged up. Most users will not have to worry about this but it is something to keep in mind while you are shopping for air purifiers. The pre-filter used in stages 1 and 2 is about $20 dollars if you purchase it separately. You only need to buy this if you want to replace the pre-filter before you replace the whole unit. A pre-filter comes with the replacement filter set. This may seem very expensive for a replacement filter. Remember that you most likely only replace this filter every five years. This means that the cost of the filter each year is only $63 dollars. If you want to see a chart comparing the 10 year cost of the Austin Air Healthmate and another brand of air purifier click here. The filters last up to 5 years. It's very good at removing odors. It's made with all steel. It has a low maintenance cost. This is one of the best air filters you can buy today. You can't change the charcoal and HEPA filter separately. There is no filter change light. Owners of Austin Air's Healthmate air purifier have mostly positive things to say about it. Helps them to sleep better. Reduced the smell of paint and remodeling. Convenient to move around the house. One report of a new filter giving off a bad smell. It can be expensive if you have to return it. We think the Healthmate Junior is one of the best air filters we've seen. It does a great job cleaning the air. It is a low maintenance machine and should give you years of trouble free use. Its smaller size means this air purifier doesn't take up a lot of space in your room. The lighter weight means it is easy to carry around. We would recommend this for everyone. 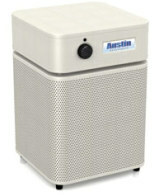 Leave Austin Healthmate Junior and Return to Austin Air Purifiers Page. Leave Austin Healthmate Junior Page and Return to All About Air Purifiers Home Page.